MIS Accounts Receivable — Accu-Tech, Inc. 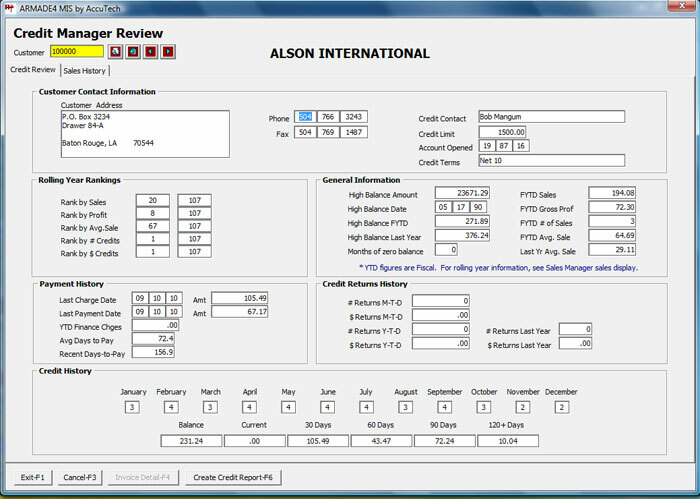 The MIS Accounts Receivable system is a comprehensive module that allows for the management, logging and tracking of your receivables, invoices, sales taxes, and cash receipts. Some of the information contained in the customer file includes: billing and shipping information (the system supports multiple shipping addresses per customer), purchase and credit contact information, shipping instructions and route designation, sales tax and exempt controls, general contact information (phone, fax, email), credit limit and terms, pricing controls, service charge controls, branch and sales territory controls, salesperson assignment, customer type and SIC indicators, account status controls (active, frozen, closed, prospect, etc. ), sales commission controls, back-order fill priority controls, links to external files (Word documents, Google Map, PDF and Image files, etc.) and more! Free-form customer notes are maintained for marketing, credit, collection, and sales management purposes. The Sales Manager option in the MIS Sales Analysis module maintains and displays customer purchase history, sales trends, profit trends, unit trends, stock sufficiency levels (ability to stock and ship percentages), rankings, and graphs. Collection Call Back Report and more! 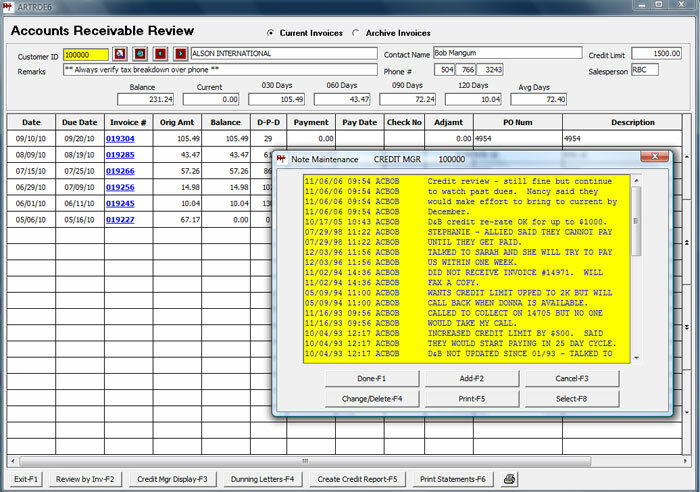 The Cash Receipts function allows payment of invoices by oldest (on account) or specific. Deposits and miscellaneous cash receipts can also be entered. Discounts or short payments can be handled from within the cash receipts function and detailed invoice review is available on-line, thus saving time when an account adjustment is needed. Once your receipts have been entered, a proof list option is available, along with a bank deposit slip. The MIS system allows for multi-level tax codes. Tax code reporting provides the necessary information for tax forms (many taxing authorities accept the reports printed by the system), and you have the option to update the taxes due to the MIS Accounts Payable module. The Accounts Receivable, Sales Analysis, and Order Entry modules contain many reports that allow you to audit, monitor, track, and analyze the many indicators necessary for superior customer service, accounting and management of your customers.